Motorcycle riding shouldn’t have to stop for any kind of inclement weather! That’s why at The Helmet Shop we keep a large selection of heated motorcycle apparel. Whether the cold is just seasonal or if it is year round, we have gear to suit your needs. Heated clothing includes pants, jackets, vests and footwear that can be rechargeable or simply run off of your bikes battery. 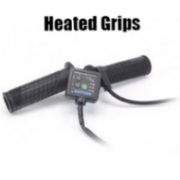 From heated balaclavas and accessories to heated gear for the bike itself, you can find the best deals here to keep you warm.